Internship | 2017 Intern’s Summer Project Published! 2017 Intern’s Summer Project Published! 2017 intern Claire Doody, an undergraduate at the University of Chicago, published the results of her summer's research in the Bulletin of the Seismological Society of America. 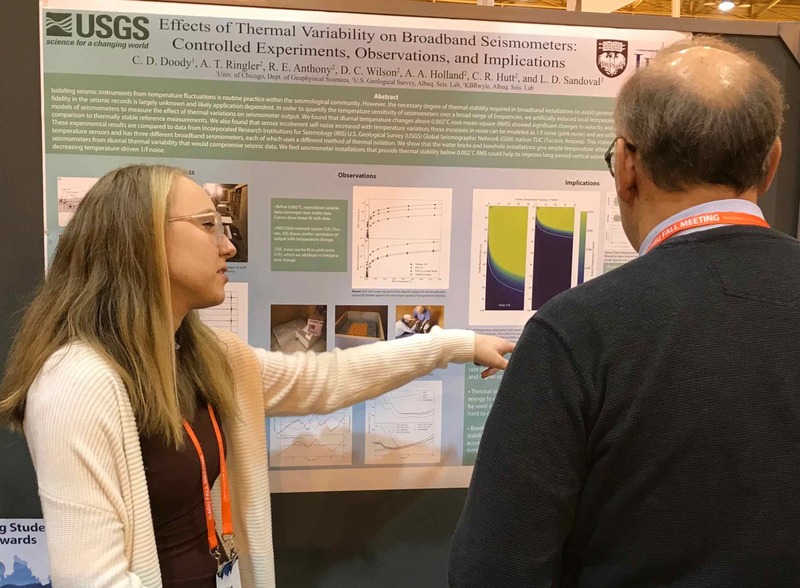 Her project, based at the USGS's Albuquerque Seismo Lab, was focused on investigating effects of thermal variability on broadband seismometers. Claire's experimental designs with instrumentation was carried out in a controlled, quiet vault under a mountain in New Mexico. Mentorship was provided by USGS staff Dr(s). Adam Ringler, Rob Anthony, and Dave Wilson. Please join us in congratulating Claire, Adam, Rob, and Dave on their work!